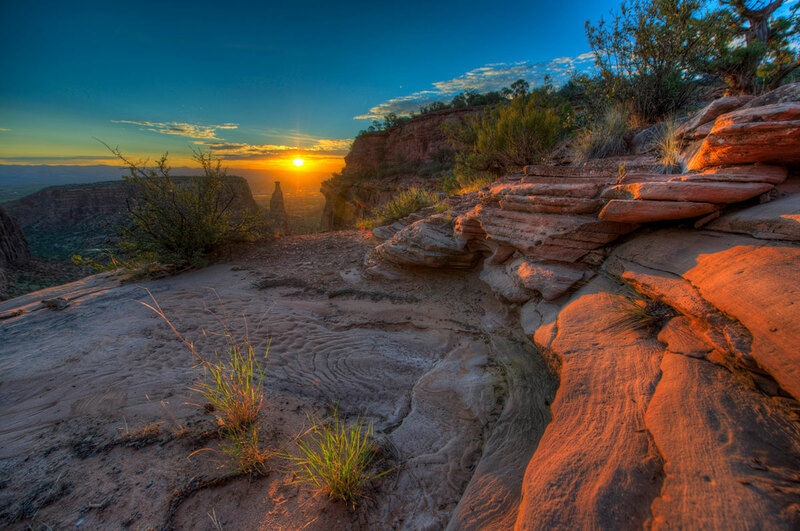 Colorado National Monument preserves one of the most unique and grandest landscapes of the American West. Sky-scraping monoliths shadow a vast plateau and canyon panorama. Sheer-walled, red-rock gorges peer over the twists and turns of Rim Rock Drive, where you may see bighorn sheep and soaring eagles. Throughout this winding maze of sandstone, massive monoliths rise from the ground, towering hundreds of feet above the valley floor. Encompassing more than 20,000 acres, the monument is lined with 43 miles of trails. Some gently carve their way along the valley, while others carve into the side of the rocks and weave their way up to incredible viewpoints, including many with hidden geological treasures. With so many options to choose from, where do you begin? 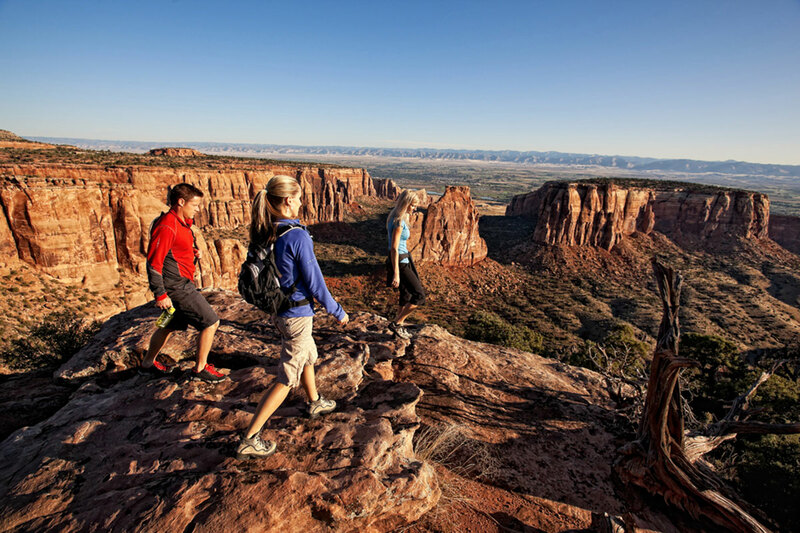 We’re here to help — here are five recommended hikes in Colorado National Monument. When entering the monument from the east entrance, Devil’s Kitchen is one of the first hikes you’ll come to. Park at the Devil’s Kitchen Picnic Area and follow signs for the trailhead. A short out-and-back trail, you only need to venture 0.6 miles to reach the heart of Devil’s Kitchen. The trail is well marked and will take you up a short rocky slope to a large, natural opening surrounded by enormous sandstone boulders that are hundreds of feet above the base. Once in the Kitchen, there is plenty to explore since the area is home to several unique geological features. This trailhead starts along with the trail for Devil’s Kitchen, but quickly breaks away and leads you along the valley surrounded by sandstone on both sides. This hike is best in the spring when the runoff from melting snow flows into the canyon, creating a series of waterfalls. You’ll come to a small waterfall pool within a mile, with another much larger waterfall ahead. This gusher has an impressive spill that has left beautiful markings on the sandstone over centuries of time. As opposed to many other hikes in Colorado National Monument, this one actually starts outside of the landmark at the base of eastern ridge of the Colorado Plateau. From the lower parking area, hike 1.5 miles to reach Liberty Cap, a great dune that is more than 160 million years old. If you’re feeling ambitious, follow the trail all the way up the monument to the start of Upper Liberty Cap Trail. Along the way, you can also make a short detour for Otto’s Bath. John Otto, the monument’s first caretaker, built many of the original trails by hand. At Otto’s Bath, he carved steps down into a large basin that dammed up so that it would fill with water during the spring snowmelt or after heavy rains. While the dam is gone, the base and Otto’s carved steps remain. The Coke Ovens are a series of giant rounded domes that sit in a perfect row. Carved over millennia by wind and water, these formations are a testament to the artistic power of erosion. This short 1-mile out-and-back hike zigzags up the side of the monument and takes you to an overlook right above the Coke Ovens, providing an outstanding bird’s-eye view. The Ute Canyon Trail makes its way through the entire gorge and can be accessed from the top or bottom. While the hike is spectacular either way, we like to start at the top, along Rimrock Drive and trek down into the canyon. The hike starts out with a steep decent down a series of switchbacks, but steps have been carved into the sandstone to make the journey easier. The switchbacks give way as you descend toward the valley floor and the trail starts to follow the natural curves of the canyon. Look for the natural sandstone arches that have been engraved into the cliff walls.